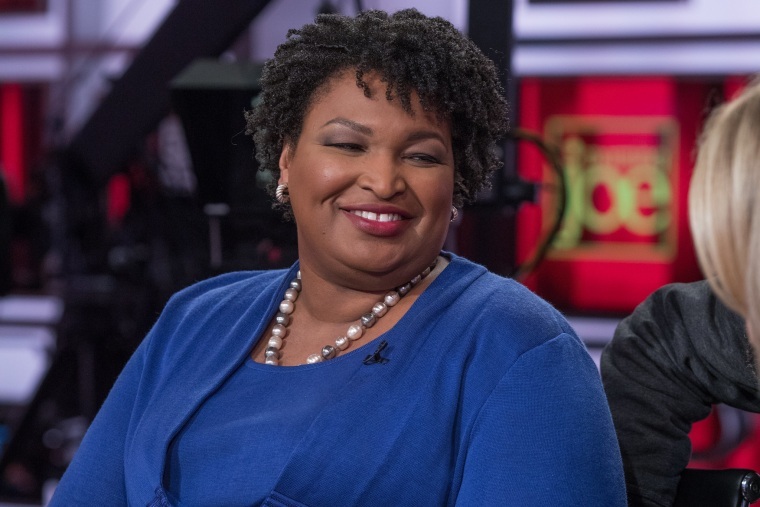 Undaunted by comments about her appearance or her 2018 gubernatorial loss, Abrams is leaving the door open to a 2020 presidential run. Stacey Abrams knows her value. She’s unabashedly proud of her accomplishments, which include serving as minority leader of the Georgia House of Representatives and delivering the 2019 rebuttal to the State of the Union. She also doesn’t allow setbacks, like her loss in the 2018 Georgia gubernatorial election, to dent her dreams. And she wants other women to be unafraid to showcase their ambition and their capacity to get the job done. That’s the Democrat’s message in her updated reissue of her 2018 book “Lead from the Outside: How to Build Your Future and Make Real Change,” which she recently discussed with “Morning Joe” co-host and Know Your Value founder Mika Brzezinski. One of the biggest barriers, according to Abrams, is that women allow feelings about their appearance to determine their capability. “I acknowledge that people will see something on the outside that tells them a story about who I am. My job is to tell them the whole story,” Abrams said. “My job is to believe my own story. Yet many women, “particularly minority women, are trained to disqualify ourselves… My belief is I know who I am … and I’m never going to allow my exterior, my phenotype, to determine my capacity,” she said. And so, undaunted by comments about her appearance or her 2018 gubernatorial loss, Abrams is leaving the door open to a 2020 presidential run. So, how can women overcome the societal pressures that would keep them down? Abrams outlines her solutions in her book. Don’t be afraid to articulate just how smart you are, Abrams said. She certainly isn’t scared: She speaks proudly about how she has been a tax attorney, studied operational dissonance of the tax code, written romance novels in additional to her memoir and even explored research in Mesopotamian astronomy. Too often our culture equates women’s confidence with braggadocio. So women are “supposed to be self-effacing,” Abrams said. But she adds that it’s possible to be confident yet humble, certain of your capability to do the job well, without thinking you’re of a higher station than others somehow.